Have you ever wanted to record your own music, podcasts, do voiceovers or sound editing? Perhaps you have already ventured out into this area, but you’d like some help to fine tune (no pun intended!) your skills. Encounter Studios is a professional video and recording studio that has worked with some of music’s biggest producers – but we are so passionate about our craft, we are always looking for new and exciting ways to share our knowledge with those who are just as passionate but are still seeking out experience in the industry. As you may be aware, Encounter Studios offers a number of in-depth two-day crash courses in a number of areas. We are now excited to announce however that we will be offering a series of audio short courses that are only four hours each. So for those of you who would like to get a jump start on your skills in audio recording we are offering ASC101, ASC102 and ASC103. This is an introductory course with no requirements other than that you must be at least 16 years old and have a desire to learn audio recording and editing. In this four hour session, we will cover Intro to Studio, DAW, Tools, Editing, EQ, Compression, Session Composition, Audio Formats and Virtual Instruments. You will leave the course having learned enough to be able to start working on your own recordings. This course builds on the fundamentals learned in in the previous course and therefore ASC101 is a requirement. It is in this stage where students will begin to learn Microphones/Dis, Gain Structure, Preamps, Effects, Advanced EQ, Advanced Compression, Dry Mixing, Wet Mixing and Cables. As you solidify the knowledge you’ve learned in ASC101 and develop more advanced skills in ASC102, you’ll start to feel even more confident in producing and editing your audio files. Our third and most advanced Audio Short Class requires that students have first taken ASC101 and ASC102. In this final four hour session, you’ll learn Acoustics, Advanced Mixing, Mastering, Dynamic Range, Mixing at home, Production Techniques, Signal Processing, Advanced hardware and Preparing for Radio. This course is ideal for the student who is the avid hobbyist as well as those looking to gain new skills to develop their career or build their own business. Why take courses with Encounter Studios? At Encounter Studios we pride ourselves on providing quality learning experiences so that students can come away with valuable knowledge that they will be able to immediately put into practice. We keep class sizes extremely small and intimate (4 people max) and provide each student with their own iMac workstation while they are attending the course. We also aim to keep courses affordable, so that anyone with a love of music can enroll. 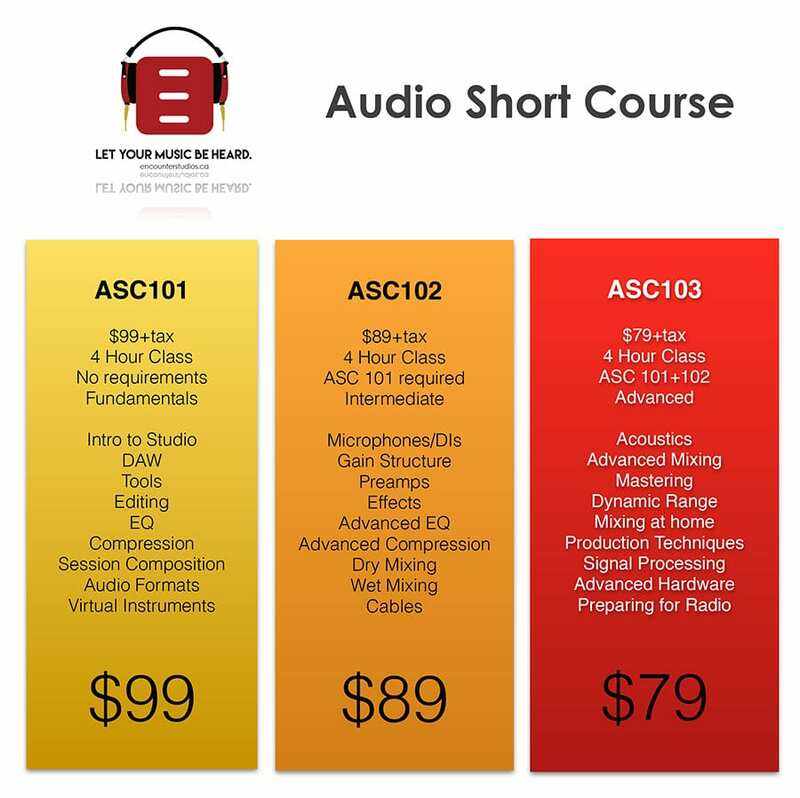 Each of our Audio Short Courses costs less than $100! If you love music and audio recording, then we are kindred spirits. And if you’re looking for a practical introduction to sound recording and editing in a professional studio environment, then we would love to hear from you and help you to get your start in the industry. As we mentioned though, space is very limited and these courses tend to fill up quickly. Call us today to reserve your spot.